It might seem innocent enough, but moving firewood has the potential to destroy thousands of trees. Moving firewood is a common way for insects and diseases to spread into our forests and urban trees. Pests can live in it, on it, or under the bark of firewood. Moving firewood gives these hitchhikers a free ride! • Why should we NOT move firewood? • What are the regulations for the movement of firewood? The Canadian Food Inspection Agency (CFIA) regulates the movement of firewood from pest-regulated areas throughout Canada. There are CFIA plant protection policies in place for quarantined pests, regulated to prevent further spread. Be aware of restrictions that may be in place; moving firewood from places that are regulated can be a violation of the Plant Protection Act. Firewood from any other country cannot be imported into Canada with the exception of some parts of the United States with strict requirements. • What insects or diseases have been spread by the movement of firewood? 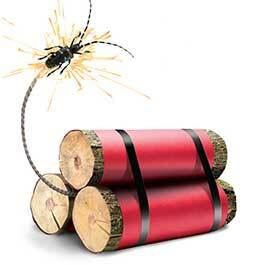 Any insect or disease that lives on or in firewood can be spread by the movement of firewood. The emerald ash borer, for example, has killed millions of ash trees in Canada since it first arrived from Asia in 2002. On its own, it does not move very far but has travelled further distances by (i.e. human assisted) movement on firewood. 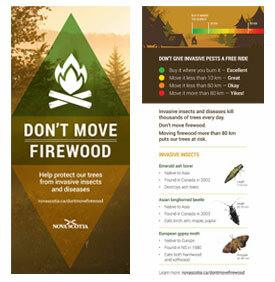 In certain areas or provinces, there may be ministerial orders that restrict or prohibit the movement of firewood from regulated areas in order to reduce the spread of invasive forest pests such as the emerald ash borer. Consult the Canadian Food Inspection Agency for information on regulated areas and transporting firewood. • What is considered locally harvested firewood? Where should I purchase my firewood? When we say local firewood, we are referring to the closest convenient source of wood that you can find. When purchasing wood as a heat source for your home, you should purchase wood from the closest convenient wood vendor and leave your firewood at home. 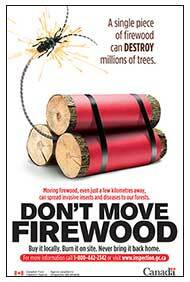 Do not take firewood from your home with you camping or to the cottage. For camping, buy it where you burn it. Most campgrounds have firewood for sale. • What types of insects and diseases could be in my firewood? • Is my firewood okay to move if I don’t see any signs of insects (e.g. exit holes, sawdust, galleries) or diseases (e.g. fungus)? No, it is still not okay to move your firewood even though you don’t see any signs of a forest pest. There may be a disease or insect on or within the firewood that is not visible to the eye. For example, there could be a tiny insect egg under a piece of bark or fungus spores on the firewood. It is best to buy it where you burn it, then there’s no risk of spreading forest pests. • What if I burn all the firewood that I bring? Even though you burned all the firewood there is still a risk that you may have spread a forest pest. For example, maybe an insect egg or larva was on a piece of bark that fell off the firewood on to the ground or an adult emerged from the wood in transit. It’s still best not to move firewood. Buy it where you burn it! • Camping or heading to the cottage — Is it okay to take the wood from the tree you cut in the backyard? It’s best to leave your firewood at home to avoid the risk of spreading an invasive forest pest. It is not a good idea to take firewood with you. Pest infestations can take years to be recognized. By the time the tree looks sick you could have spread the infestation to all your favorite campsites! Don’t take a chance. Get your firewood at your destination. Buy the wood as close to where you burn it as possible. • Is kiln dried firewood okay to move? Packaged firewood comes in a lot of forms and it is important to know the difference between kiln dried and heat treated firewood. Kiln drying removes the moisture content from the wood but does not sterilize or rid the wood of all pests. There is still a risk of moving some invasive forest pests with kiln dried firewood. Woodborers such as the emerald ash borer can survive on firewood that has been kiln dried. Heat treatment ensures the internal temperature of the wood reaches a critical temperature for a set duration in order to kill all life stages of pests. It is this process that is used to eradicate any living organisms in wood. • Where is there additional information on the Don’t Move Firewood campaign?